Since July 2018, most of my Facebook ads for viral quiz were rejected for poor/or low quality landing page experience. Not only me, some of my friends and some of my blog reader also experienced this problem. Now it is becoming more common in August, 4 out of 5 quizzes post are rejected by Facebook. Some of the post got approval at first time, but it was rejected later. I am looking for several ways to overcome this issue and found out this solution. It works well with me so far. You have to write very long description for each quizzes. It will also help you to get low cost per engagement. Only place 2 Ads per page. If you follow above things, your will get less rejection by Facebook. 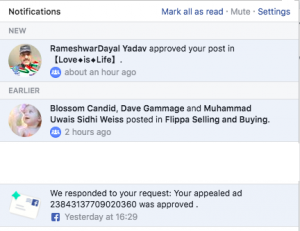 In case if you get rejected, you have to edit your landing page according to above two things and submit appeal to Facebook. 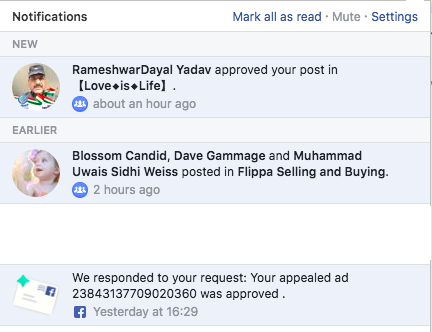 Your disapproved ads will be approved again soon. This is getting hard. Is it OK to spam on fb pages or group? What if your acc got blocked by FB? You need to write long description for each quiz. Even you write long description, some of the quiz still get rejected. Maybe FB think it’s not suitable to be displayed to their audience. Thanks for the tips. Yah, you need to be very careful about the words used in your quiz and also the image of the quiz. Are you still campaigning for facebook ads? All of my ads are being disapproved. Yah, I am still running some ads. But not in large scale. I am now writing about Facebook Ads. Already created a post at my blog. Read it. I hope it will help you .